This is not a regular map. It has two hexagonal faces, three 4-valent vertices, and six edges. 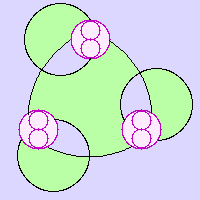 Its Petrie polygons have four edges. Two of its holes have three edges, six of them have one edge. The symbols in the diagram are crosscaps. Other maps on the genus-C3 non-orientable surface.